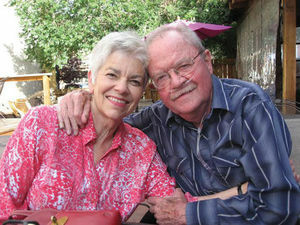 Bestselling author Kent Haruf, who died November 30, 2013, is shown with his wife, Cathy in August. He died peacefully at home at age 71. An excerpt from The Mountain Mail, Salida, Co., Tuesday, December 2, 2014 8:51 am | Updated: 9:02 am, Tue Dec 2, 2014. Read the full story. Salida resident and author Kent Haruf, 71, died peacefully at his home Sunday, November 30. Although Haruf was known worldwide for his bestselling novels, in Salida he was mostly a beloved friend and mentor to many. His passing came after a long illness. In recent months, he was a hospice patient – an organization that he supported for many years. Haruf had just completed his last novel, “Our Souls at Night,” which will be published next year. Prior to moving to Salida in December 2000, Haruf spent 30 years teaching English and writing. Authorlink did a phone interview with Kent for its February 1, 2014 edition for his book, BENEDICTION, A QUIET SALUTE TO ENDINGS.